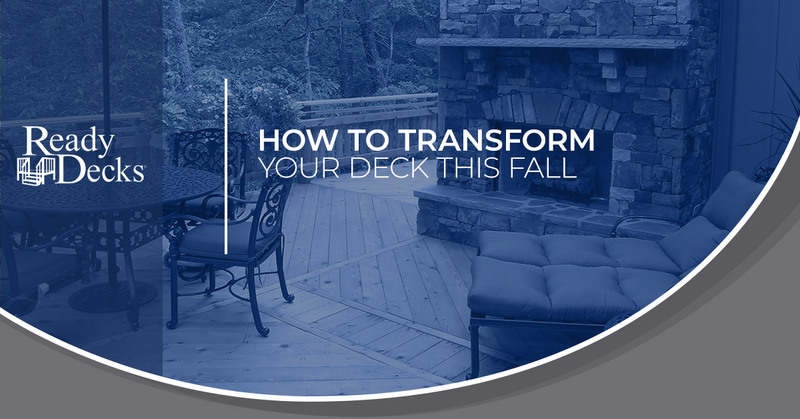 In our most recent post, we offered some deck maintenance tips for fall. But what should you do once you’ve completed these chores? Unfortunately, many homeowners put away their outdoor furniture and close off their deck area soon after cooler weather arrives. The outdoor fun shouldn’t end when the sun goes down. By adding a few lighting fixtures, you can get the most out of your deck during the fall. If you have no idea where to start, think about browsing string lights and lanterns before other options. The key to outdoor lighting is making the space feel warmer and more inviting. There’s no need to go overboard, either. You should be able to find the right lighting products at a price that won’t break the bank. Worried that your deck’s plush furniture won’t hold up to autumn’s wet weather? Then try finding some pieces that are more durable and, of course, water-resistant. Another idea to consider is buying seat cushions to maintain the same level of style and comfort. Perhaps you’re in the process of either building or redesigning your deck. In either case, it makes sense to opt for built-in seating. This way, you won’t have to worry about buying a brand new furniture set. This is an easy way to add a festive feel to your deck. You shouldn’t have much difficulty finding one that matches pretty closely with the furniture. Although a rug may seem like a minor addition to this space, it definitely brings much-needed warmth and color. Still not convinced on buying a rug for the deck? Then enjoy another season of walking on cold, bare planks. Rugs can also be used to protect your deck when moving furniture or other objects. You made an investment when you purchased a deck. That said, you would go above and beyond to protect your investment. A permanent covering can create a barrier from the cold so you and your family can enjoy the deck well into the cooler months. Are you interested in a covering but would prefer a more temporary one? Your local deck builder should be able to work with you in finding the right awning or another type of soft-top covering. No deck would be complete this time of year without a few pumpkins, dried corn stalks, and gourds. Think of this space as an extension of your home’s interior. Pro tip regarding decorating: Place any pumpkins on an elevated surface to help prevent trapping moisture on the deck. Here at Ready Decks, we continue to put our customers first. For nearly two decades, quality, value, and integrity have been at the top of our priority list. If you’re in the market for a premade deck, don’t just settle on any deck installer. See what the Ready Decks team can do for you.